Upside Down Under: The Adventure Begins! Red Sky Presents is happy to announce a new e-book and Print-On-Demand series for children called “Waddley Sees The World” by Julie Canter Davis. 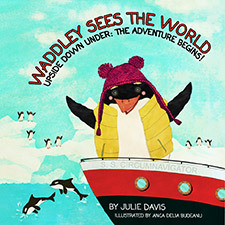 “Upside Down Under: The Adventure Begins!” debuts December 18, 2013, and is the first release in the “Waddley Sees The World” series which chronicles the adventures of Waddley, a penguin who leaves Antarctica aboard a cruise ship to travel the world. Each book of the series will feature Waddley, and the two young children who befriend him, at a new exotic destination, combining fun and adventure with geography and history. Author Julie Davis Canter is the author of more than 18 books for the juvenile market. “We are committed to bringing readers great series by terrific authors,” said Micky Hyman, Publisher of Red Sky Presents, “so we are proud to launch this new series for kids which deals which lets kids explore the world in a way that is entertaining and fun.” said Micky Hyman, Publisher of Red Sky Presents.